Amidst the clothes, models, celebrities, and theatrical staging, the literal nuts and bolts holding up a fashion show, the sets are often one of the least notable elements of the spectacle. Art collective Rotor specialise in bringing forth the remnants of a world that, after a moment of meaningful splendour, is discarded. They have taken the architectural and scenographic elements realised for the fashion show sets designed by Prada and OMA, for a show at the Fondazione Prada in Milan called ex limbo. These constructional elements are then presented in new ways urging viewers to take a second look at them and the ideas they represent. Ahead of the opening, which co-insides with Milan Design Week, Rotor artist Tristan Boniver talks about ideas that can be overlooked or missed in the fast-moving world of fashion presentations. Dazed Digital: Where has the work in Ex Limbo come from? Tristan Boniver: The objects that will be seen are the result of the work of the many actors behind the Prada fashion shows: the people that designed the fashion shows, be they Prada or OMA, the people that built them, the people that dismantled and stored them. Our own work has consisted in undertaking our decision of bringing them all into the Fogazzaro exhibition space. This, of course, was made with the help of all these different actors. DD: What materials is it made from? Tristan Boniver: Steel tubing structures, Aluminum sheets, PE foam, plywood panels, composite panels with corrugated cores, MDF, PMMA panels, vinyl, light fixtures, canvas and paint, many layers of paint. This list is almost exhaustive. 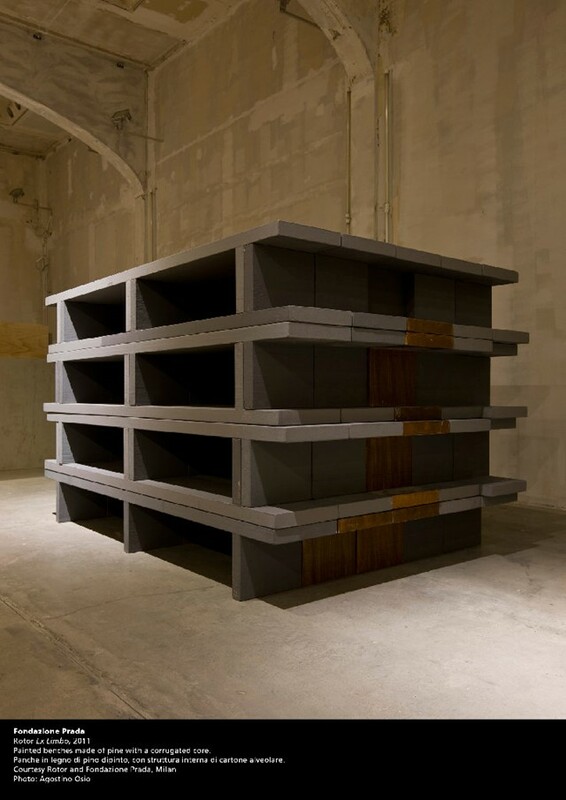 DD: What is the significance of this show taking place at the Fondazione? Tristan Boniver: The Fogazzaro exhibition space is where the current Prada fashion shows are now taking place. Many of the materials have been only used here once or twice, for the few instants of the fashion show. This space is also located at the heart of Milan, where, as we discovered, so much happens around the subject. DD: How important do you think it is that artists find a new use for waste materials? Tristan Boniver: A witty answer would be 'ask the artists', but there is still matter for debate, surely beyond the artistic discipline... The simple use of the word 'waste', for example, is a goldmine of meaningful questionings. DD: Fashion, by its very nature of always striving for new, creates so much waste; why choose to look at what it leaves behind? Tristan Boniver: While we were first interested by the amount of materials kept after the fashion shows, we turned out to be even more interested in the amount of ideas kept in the storage, beyond their simple materiality. Every item in the Fogazzaro space is actually the materialization of an idea. For one, their materiality can be seen as a problematic burden; for the other, as a precious bearer of a memory. How and why these ideas are being kept, this became the subject. DD: How does your ethos as a collective sit with the throwaway nature of fashion? Tristan Boniver: This is an interesting question, but it is practically impossible to give you a constructed answer now. DD: Is an important part of your work drawing attention to things that are often overlooked? Tristan Boniver: Indeed, yes, but not because the things are overlooked. Primarily because the questions they carry are skipped by the fast-moving context in which they arise.